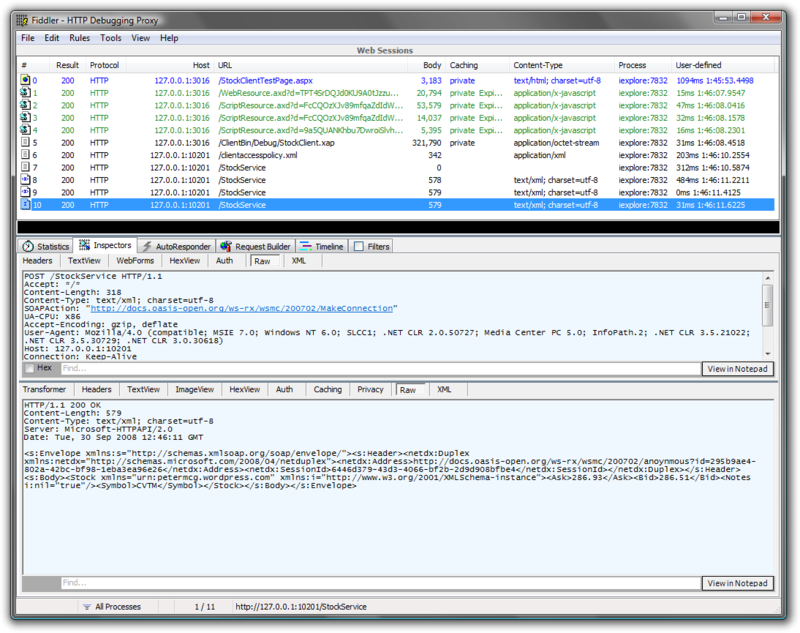 This post takes a brief look at the options for capturing localhost HTTP traffic in the superb Fiddler2 tool but in particular demonstrates how this can be achieved using the less-renowned ipv4.fiddler keyword in a Silverlight 2 polling duplex debugging session. At this stage the two previous workarounds have both proven unsuccessful, let’s try the same process this time with another technique listed in the relevant help section on the Fiddler2 website – use of the ipv4.fiddler keyword. 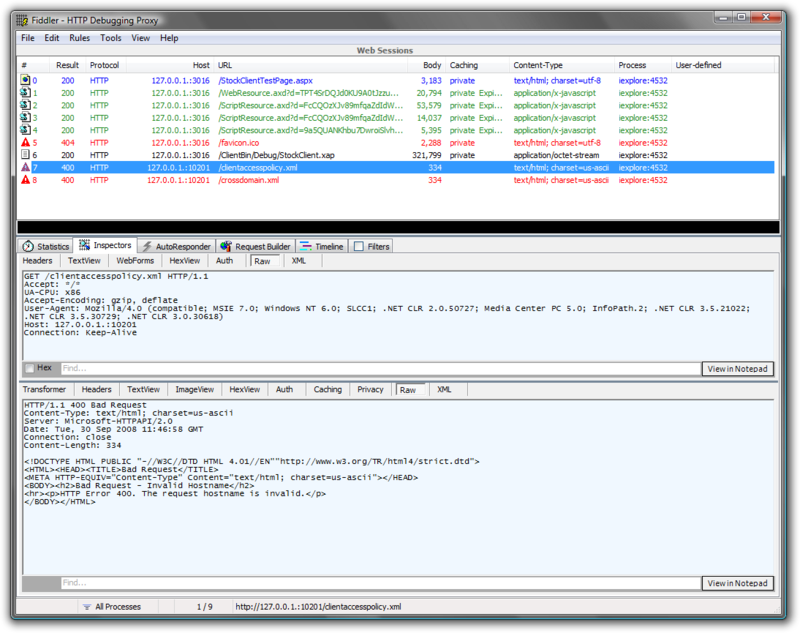 The ipv4.fiddler keyword requires Fiddler v2.1.8 or later to be running, I should also mention the ipv6.fiddler keyword (not covered in this post) for IPV6 debugging. 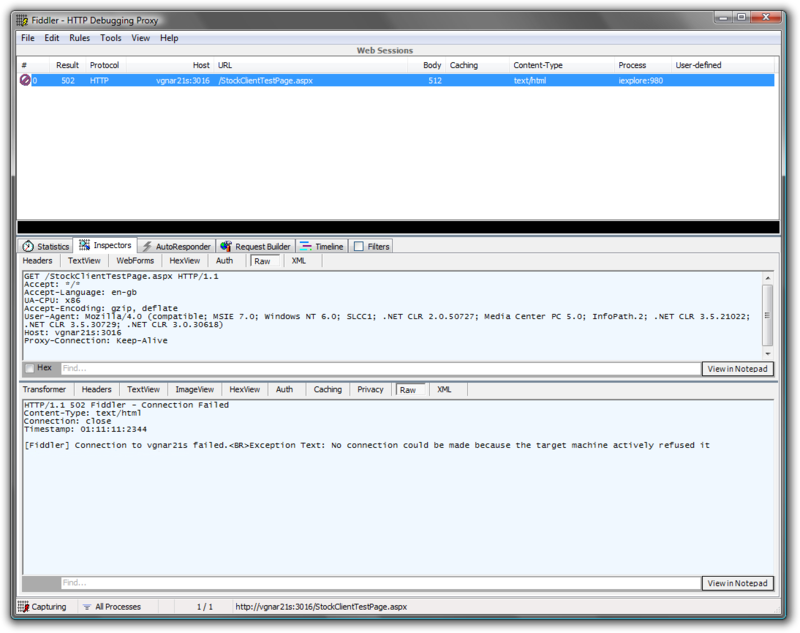 Success – this workaround accomplishes exactly what we set out to achieve, the screenshot above shows the capture of all HTTP traffic going between the client and server. It shows everything from the initial request for the hosting aspx page, downloading the .xap file, the request and custom self-hosted response for the clientaccesspolicy.xml file and finally the actual polling duplex activity on the wire. Note the content of the User-defined column, this is as a result of turning on ‘Show Time-to-Last-Byte’ and ‘Show Response Timestamp’ under the Rules > Performance menu in Fiddler2. For a deep-dive into exactly what these polling duplex requests and responses contain, please see the ‘Anatomy of a Bi-Directional Message Exchange’ heading in Part 1 – Architecture of my series of posts on polling duplex in Silverlight 2. This entry was posted on September 30, 2008 at 1:44 pm	and is filed under Debugging, Fiddler, PollingDuplex, Silverlight. Tagged: Fiddler, ipv4.fiddler, Silverlight. You can follow any responses to this entry through the RSS 2.0 feed. Both comments and pings are currently closed. But when it comes the Binary Encoding, fiddler is useless, it doesn’t help much. Well my problem got solved, as now there is a Fiddler Extention (WCF Binary) available.